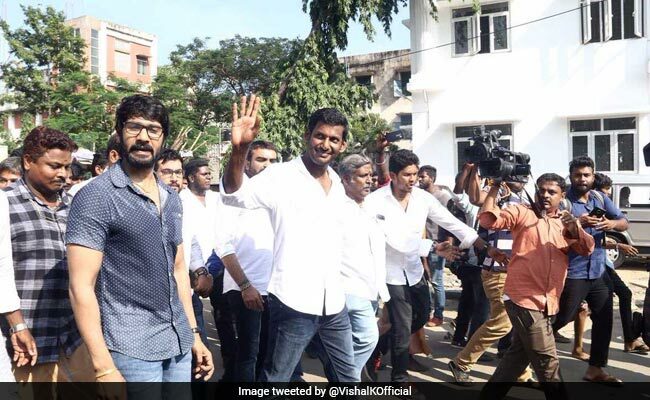 New Delhi: Actor Vishal, whose nomination for Chennai's RK Nagar by-election was rejected, today said he will not support any candidate and will announce his next move in politics soon. "Some news is being spread that I am supporting some persons. So far I have not said about supporting anyone. I have not at all taken any such decision," Vishal said in a statement. There was speculation on social media that the 40-year-old actor could throw his weight behind a candidate of another party. Election officials said the actor's nomination papers only had "valid" signatures of eight proposers, not the mandatory 10. On Thursday, Vishal said the two people who had reportedly proposed his nomination for the RK Nagar by-poll are under threat from Tamil Nadu's ruling AIADMK. "I am worried about those two people who signed up for me. We are not able to get in touch with them," he told NDTV. RK Nagar in Chennai was the assembly constituency of the AIADMK's powerful leader J Jayalalithaa, who died as chief minister in December last year. It is vital for the AIADMK, seemingly rudderless since Ms Jayalalithaa died, to establish that Chief Minister E Palaniswami and his team are in control. The AIADMK has fielded a senior leader, E Madhusudanan, who has held the seat before and has influence among Telugu people who have a sizeable presence in RK Nagar. Vishal's star power and Telugu roots are being seen as a direct threat to prospects of AIADMK's candidate Madhusudanan, who too, many insiders say, banks on the community's support. But the party denies the actor's allegations. Ma Foi Pandiarajan, Tamil Culture Minister, said "All those allegations are untrue."